Butternut squash is a winter squash that grows on a vine. It has a sweet nutty taste similar to that of a pumpkin. The skin is tan-yellow with an orange fleshy pulp with a compartment of seeds in the bottom. When ripe, it turns increasingly deep orange and becomes sweeter and richer. It is technically a fruit but is used as a vegetable that can be roasted, toasted, pureed for soup,s or mashed and used in casseroles, breads, and muffins. It is a good source of fiber, vitamin C, manganese, magnesium and potassium. It is an excellent source of vitamin A and vitamin E.
One of the most common ways to prepare butternut squash is roasting. The squash is cut in half lengthwise, lightly brushed with cooking oil or put in a thin layer of water and placed cut side down on a baking sheet. It is then baked for 45 minutes or until soft. Once roasted, it can be eaten in a variety of ways. The squash is prepared by removing the skin, stalk, and seeds, which are not usually eaten or cooked. The seeds are edible, either raw or roasted. The skin is also edible and softens when roasted. Options: a dash of cayenne pepper and some craisins can be added or a dash of cinnamon. Place pecans on an ungreased baking sheet. Toast at 350 degrees for 5-8 minutes. Peel the squash and remove the seeds. Cut into ½ inch cubes. You could microwave the cubed squash for about 5 minutes before it goes into the pan. Melt butter or margarine in a heavy large skillet over low heat. Add onion and saute until very tender, about 15 minutes Add squash and toss to coat. Cover. Cook until squash is tender but still holds it shape, stirring frequently, about 15 minutes. Season to taste with salt and pepper. Can be prepared 4 hours ahead. Let stand at room temperature. Rewarm over medium heat before continuing. Stir in half of the pecans and half of the parsley. Transfer mixture to bowl. Sprinkle with remaining pecans and parsley. Option 1: Preheat oven to 400 degrees F. Combine pears, squash potato, tomatoes, onion, garlic, carrot, celery, ginger, oil, ginger, salt and pepper in a large bowl; toss to coat. Spread evenly on a large rimmed baking sheet. Roast, stirring occasionally, until the vegetables are tender, 40-55 minutes. Let cool slightly. Place half the vegetable and 2 cups broth in a blender; puree until smooth. Transfer to a large saucepan. Puree the remaining vegetables and 2 cups broth. Add to the pan and stir in lemon juice. Cook the soup over medium-low heat, stirring until hot, about 10 minutes. Option 2: In a large saucepan, heat the oil, add the onion, celery and carrot and saute for 3 minutes, or until onion is translucent. Add the garlic and ginger and saute for 1 minute longer, stirring constantly. Add the pears to the pan with the squash, potato, and stock and bring to a boil. Reduce heat and simmer and cook for 30 minutes or until the squash is tender. Add lemon juice. Transfer soup to blender and puree until smooth. 1. To prepare the wheat berries: Rinse them then place them in a medium pot with 3 ½ cups water. Bring to boil over high heat, cover and reduce heat and simmer for 1 hour, or until the wheat berries are pleasantly tender but still have some chew to them. Drain off excess water, return the wheat berries to the pot and stir in ¼ tsp salt. Set aside to cool. 2. To roast apples: Preheat oven to 425 degree F. Line one small and one large baking sheet with parchment paper. On the small sheet, arrange the apple wedges in a single layer. Bake the apple slices on the middle rack for 10 minute, until they are starting to collapse on themselves but before they have burst open. Let the apple slices cool on the pan before removing. 3. Meanwhile, to prepare the squash: Slice off the top and bottom ends of the squash, then slice it in half vertically. Use a spoon to scoop out the seeds and discard them. Slice the squash into ½”wide half-moon shapes. Transfer the squash to the large baking sheet and drizzle with 1 Tbsp olive oil. Toss until the squash i lightly coated in oil and sprinkle with salt. Arrange the squash in a single layer and roast for 30 minutes, tossing halfway, until the squash is tender and caramelized on the edges. Set aside to cool. 4. To prepare the pecans: In a medium skillet over medium heat, toast the pecans until they are fragrant, stirring frequently, about 4 minutes. Add the maple syrup and a generous pinch of cinnamon and salt and cook, while stirring constantly, until the syrup has condensed and mostly evaporated, about 2 more minutes. Transfer to a plate to cool. 5. To prepare the dressing: In a small bowl, combine the olive oil, lemon juice, ginger, maple syrup, mustard and salt. Whisk until thoroughly blended and season to taste with freshly ground black pepper. 6. 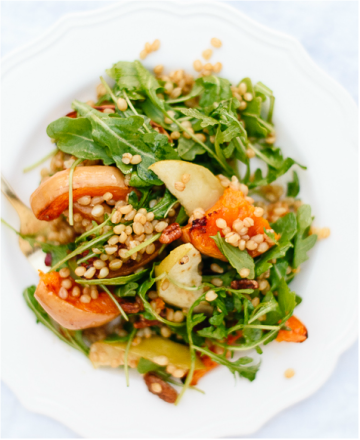 To assemble the salad: In a large serving bowl, add the arugula, cooled wheat berries and apple slices. Before you add the butternut, you might want to slice the larger half moons in half, so they are more bite sized. Add the butternut, dried cranberries, and pecans, then drizzle with dressing. You might not need all of it. Toss to lightly coat. Serve immediately. Preheat the oven to 400 degrees F then place the diced butternut squash, onion, garlic, jalapeno and poblano pepper in a 9 X 13” baking dish and toss with oil. Sprinkle with cumin, salt & pepper (to taste) then mix until evenly distributed. Roast vegetables in the oven for about 40-45 minutes, until the squash is tender. Remove from the oven then lower temperature to 350 degrees F.
Transfer the roasted vegetables to a large bowl along with 1 cup salsa, drained and rinsed black beans and chopped cilantro. Using the same baking dish that you roasted the veggies in, prepare the casserole by spreading a thin layer of the salsa along the bottom, then cover with a layer of tortillas. Top the tortillas with ⅓ of the roasted vegetable mixture then ½ cup cheese. Lastly, add the last of the tortillas, a think layer of salsa and the last ⅓ of the vegetables on top. Sprinkle with remaining cheese and bake in the oven for 20 minutes, until light golden brown on top. Allow to cool for at least 5-10 minutes then cut into squares and serve. Garnish with avocado, cilantro or plain Greek yogurt. Preheat oven to 350 degrees F. Lightly oil a 9X13” baking dish. Mix the warm melted butter, thyme, sage, and sugar together in a small bowl. Place cubed butternut squash in prepared baking dish. Drizzle with seasoned butter. Roast uncovered in preheated oven until tender, about 20 minutes. Heat oil in a skillet over medium heat. Toast quinoa in oil until light brown, about 5 minutes. Add broth to quinoa and bring to a boil. Cover and turn heat to low Cook for 10 minutes without disturbing. Remove from heat and let sit covered until broth is absorbed, about 3 minutes. 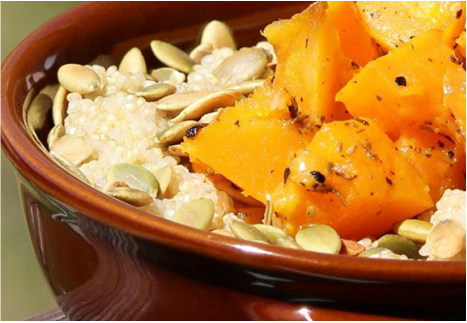 Stir the quinoa and pumpkin seeds into the roasted squash and serve.